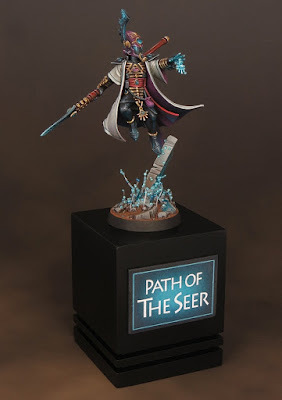 Most of you have probably already seen this by now, but this is the latest Slayer Sword winning effort by hobbyist extraordinaire David Soper. He recently entered this into the Enemies of the Imperium Golden Demon and took home the Sword, winning the competition, and it's easy to see why. First off, the conversion is flawless on this. It combines parts from the plastic Farseer, Harlequins, and I believe the plastic Farseer on a Jetbike. All of these are combined into one cohesive model with the help of some excellent sculpting skills as well. It really portrays the agile and light nature of the Eldar perfectly. I particularly like the rune floating away from his out stretched hand. The painting is crisp and smooth, as we have come to expect from him. I really like the stark choice in colors. 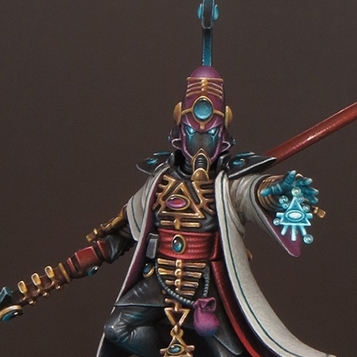 The black of the armor and the off white of the robe really play off each other well with the red and purple helping to accent it and give it a bit more color. The bright electric blue is what draws the eye right away, and he uses just the right amount of it. You definitely get the feeling that the Farseer is casting some potent psychic power right now. I really like the weird little motes of energy floating up from the base. This looks like a continuation of his exploration with plastic beads that he started with his equally awesome Gutrot Spume model. The non-metallic golds are perfect and the fact that he painted a very subtle texture onto the fabric of the robe is just the icing on the cake. This was clearly very deserving of the Slayer Sword, and it was created and painted in a relatively short time too compared to some of his other projects. Beside just clicking on the link below to check out more views of it on Putty and Paint, be sure to explore his website here. You can even see his next big project, an Ironjawz Megaboss.